Wear boots with rubber soles that can give you good traction on outdoor surfaces. Shoes or boots with plastic or leather soles will be slippery in snowy or icy conditions, and you are at greater risk of falling if you wear them. Avoid walking on uneven surfaces wherever possible. Keep your hands out of your pockets when walking outside in the winter. You want to have your arms free to hold out to your sides to give you better balance if you feel yourself starting to slip. 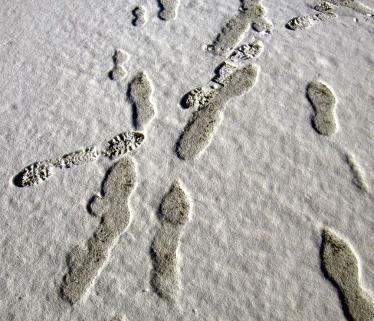 If you have to walk across an icy patch, take small, shuffling steps. Bending your knees slightly when walking outside in winter can reduce the likelihood of a fall. Avoid carrying large boxes or packages outside in the winter. A large purse can also cause you to lose your balance; a safer bet may be to choose a smaller one when the mercury starts to drop. Make a point of looking down at the ground before you get out of your car. If you have parked on a piece of ice, you may want to move to a different spot to avoid injury.